We had a major snow storm blow in last night so today became a day for serious cleaning, purging and reorganizing of the house. It also allowed the perfect opportunity to try a delicious recipe I found on my favourite food blog, smitten kitchen! Something about a cold snowy day just begs for a huge bowl of pasta filled with tomatoes, garlic, parmigiana cheese and basil. The perfect snow day lunch! Finn has also taken a recent liking (loving) to garlic, so we were able to give him a few noodles to play around with and entertain us while he smiled and licked off the garlic. Preheat the oven to 400°F. Grease a 13-by-9-inch baking dish with 2 to 3 tablespoons of the oil. Place the tomatoes cut side up in the dish. 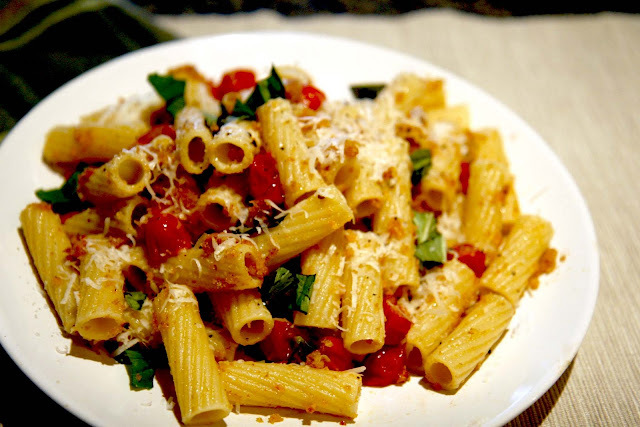 In a small bowl, combine the bread crumbs, cheeses, and garlic and toss with a fork to mix well. Sprinkle the bread-crumb mixture over the tomatoes, making sure that each cut side is well covered with the crumb mixture. Sprinkle with salt and pepper, and then the final tablespoon of olive oil. 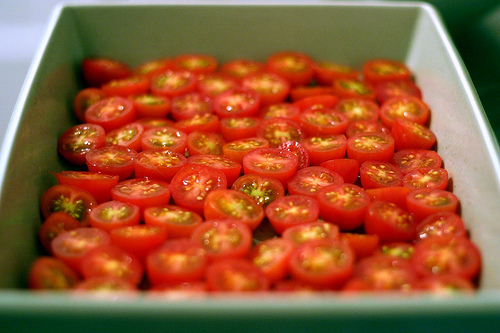 Bake until the tomatoes are cooked through and starting to brown on top, about 20 minutes. Meanwhile, bring a large pot of salted water to a boil. Add the pasta and cook for 8 to 10 minutes, or until al dente. Time the pasta so it finishes cooking about the time the tomatoes are ready to come out of the oven.